Visiting Vietnamese National Assembly Chairman Nguyen Sinh Hung and his Cambodian counterpart Heng Samrin co-chaired a Vietnam-Cambodia Business Forum in Phnom Penh Monday with the participation of about 400 businesses from the two countries. Addressing the event in the Cambodian capital, Mr. Hung said the forum was a vivid manifestation of solidarity, friendship and development between the two neighboring nations. 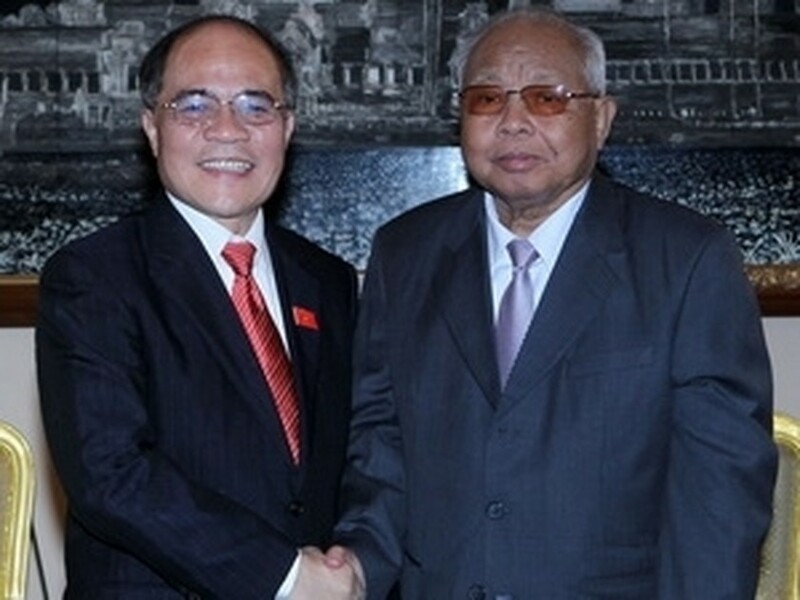 He expressed his pleasure with the strong development of the Cambodian economy and the improvement of people’s living conditions and laws, describing them as good signals for the two countries to promote two-way investment and cooperation to invest in the Association of Southeast Asian Nations (ASEAN), the region and the world. He urged Vietnamese investors to coordinate with Cambodian firms to create a close link, build solidarity, friendship and cooperation. 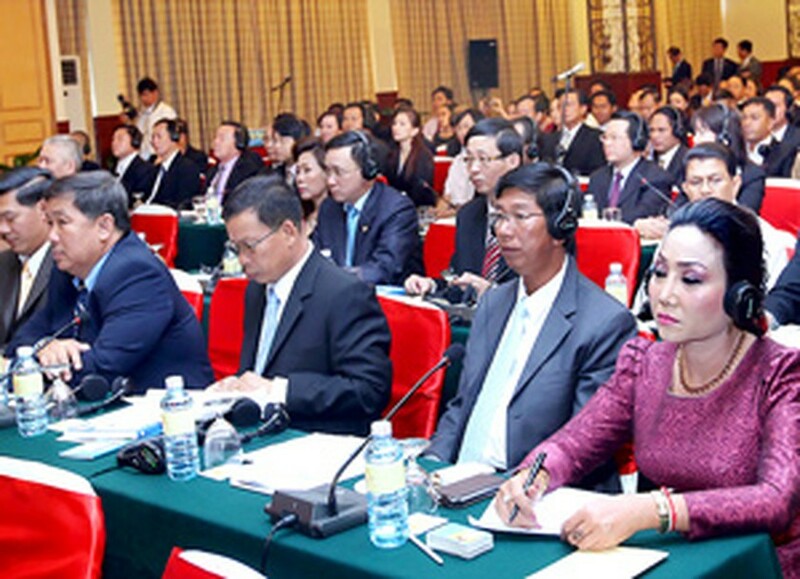 Cambodia’s NA President Heng Samrin said that the forum, held ahead of the 32nd General Assembly of the ASEAN Inter-Parliamentary Assembly (AIPA-32), was a good opportunity to promote Vietnam’s investment in Cambodia. He affirmed the presence of Vietnamese investors is an important factor, contributing to encouraging investment activities in Cambodia, and promised to create favourable conditions for them to invest in the neighbouring nation. The Cambodian lawmaker suggested Vietnamese businesses tune into Cambodia’s key fields such as agriculture, agricultural product processing, mining, services, banking, securities, science and technology and tourism. Also on Monday, the Vietnamese top legislator met with President of the Cambodian Senate Chea Sim, affirming Vietnam’s priority of strengthening and developing traditional friendship and comprehensive cooperation with Cambodia. Vietnam always considers the shared relations as the common invaluable treasure needed to be strengthened for the development and prosperity of the two countries, Mr. Hung added. He stressed the similarities and difficulties of the two countries in periods of history, saying that the two sides need to tighten solidarity, promote cooperation projects, contributing to maintaining peace, stability in the region and the world as a whole. He briefed Mr. Chea Sim on results of talks and meetings with King Norodom Sihamoni, National Assembly President Heng Samrin and Prime Minister Hun Sen, saying that the two sides agreed to continue fostering the Vietnam-Cambodia special friendship and solidarity for the interests of the two peoples. Mr. Chea Sim welcomed the current visit to Cambodia by him, saying that it would be a milestone in promoting and deepening comprehensive cooperation, while contributing to fostering friendship between the two countries and peoples. 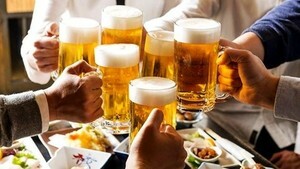 Based on a firm, traditional foundation, the two sides should actively exchange delegations, hold talks and accelerate cooperative agreements in all fields, including politics, diplomacy, security, defence, socio-economics and especially the close cooperation between the two legislative bodies.